Callaloo may be a rarely used vegetable here in North America, but in the Caribbean (especially Jamaica) this leafy green vegetable rules! Originally of West African origins, the plant migrated over to the caribbean with the Africans. When we saw the plant at our local garden store we had to buy it, hopefully we’ll be able to find it every year. In this recipe we marry the sweetness of the stewed tomatoes with the soft green callaloo and some key Jamaican spices. It seems to work best served over rice but can also work with pasta! It’s a great accompaniment to spicy grilled meats such as BBQ’d Jerk Chicken, Roast Pork or even stewed goat. 2. Add the crushed pimento seeds and thyme. If you are using some of the callaloo stalks toss them in too. 3. Add 1 cup of chicken (or vegetable) stock and allow to come to a boil. 4. Once boiling add the cut plum tomatoes and some salt. 5. 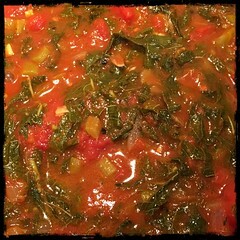 After the tomatoes have stewed for awhile, add the cut callaloo and mix well. 6. After cooking for 10-15 minutes sample it and add salt and pepper to taste. You can also add some more coconut oil or some unsalted butter. 7. Continue to let it stew until you’ve reached the consistency you like.